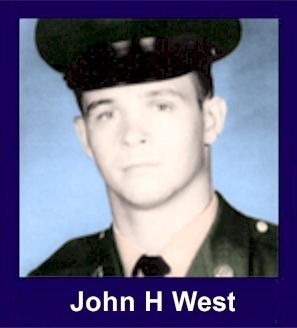 The 35th Infantry Regiment Association salutes our fallen brother, PFC John Hayden West, who died in the service of his country on March 7th, 1969 in Kontum Province, Vietnam. The cause of death was listed as Small Arms/AW. At the time of his death John was 20 years of age. He was from North Bergen, New Jersey. John is honored on the Vietnam Veterans Memorial at Panel 30W, Line 67. The decorations earned by PFC John Hayden West include: the Combat Infantryman Badge, the Bronze Star with V, the Purple Heart, the National Defense Service Medal, the Vietnam Service Medal, the Vietnam Campaign Medal and the Vietnam Cross of Gallantry with Palm Unit Citation. I played Little League baseball against Jackie West and played on the same All Star teams with him. He was truly a great guy, one of the nicest guys I ever knew. Last month I visited him at The Wall and I stop by his grave from time to time. I had my daughter leave a baseball at The Wall many years ago by his name and I was pleased to see it displayed at the storage facility in a Smithsonian special, The Wall at 25. I was in-country when he was KIA, I saw his name in Stars and Stripes. I miss him and think of him often. RIP Jack you are not forgotten. John Hayden West (known to his friends and family as "Jackie") was born on November 29, 1948 in Jersey City, NJ. "Jackie West, who played on the first Pop Warner team, who gave us quite a few thrills at Capsaw Lake in one of our first games, went onto North Bergen High School to play football, baseball and basketball and made the supreme sacrifice on the battlefield in Vietnam." Jackie believed that if Americans were to remain free then all Americans had to do their share and he was doing his. His wife said that Jackies morale was high until his last letter. She received it the day before he was killed on March 6th. He wrote, "We are busy, things are hectic and we were out on a long mission in the jungle. We climbed up and down mountains." The letter continued, "Our mission captured 82 Vietcong and next to their camp, we found a camp of South Vietnamese who said they were shooting at us accidentally. Who the hell are we fighting here anyway?" In other letter, the young soldier said the South Vietnamese treated the Americans well and gave them bananas and other fruits. In addition to football, he wrestled for two years, played basketball for one year and belonged to the Key Club. Jackies ambition was to be an IBM programmer when he was discharged. Jackie was a devoted son and loving brother, always ready to protect his sisters. He was a loyal friend to many. Jackie was very proud when his nephew, Patrick, was born in 1964. When Jackie married Linda Barsumian on October 6, 1968, Patrick acted as the ring bearer. Jackie was married only six short months before he was killed in action. However, by a stroke of good fortune and a chance meeting at Jackies gravesite, Jackies widow, Linda, was reunited with the West family in 2003, after 29 years. She has become close with the family again. Jackies medals and awards are now proudly displayed in his nephew Patricks house. Besides his brother, James, and two sisters, Pamela and Shelley, five nephews, Patrick Panagiotou, Steven Panagiotou, George Panagiotou Jr., his namesake Jackie West and James West Jr., survive him, also three great-nieces, Katie Panagiotou, Kelly Panagiotou and Christina West and two great-nephews, Kyle Panagiotou, and Jesse West. Jackies mother, Elizabeth West, and his father, James West, are buried next to Jackie in the George Washington Memorial Park in Paramus, New Jersey.